Kidney cancer is cancer with a primary origin in the kidneys. The kidneys, which are responsible for filtering waste from the body, are located on either side of the spine. 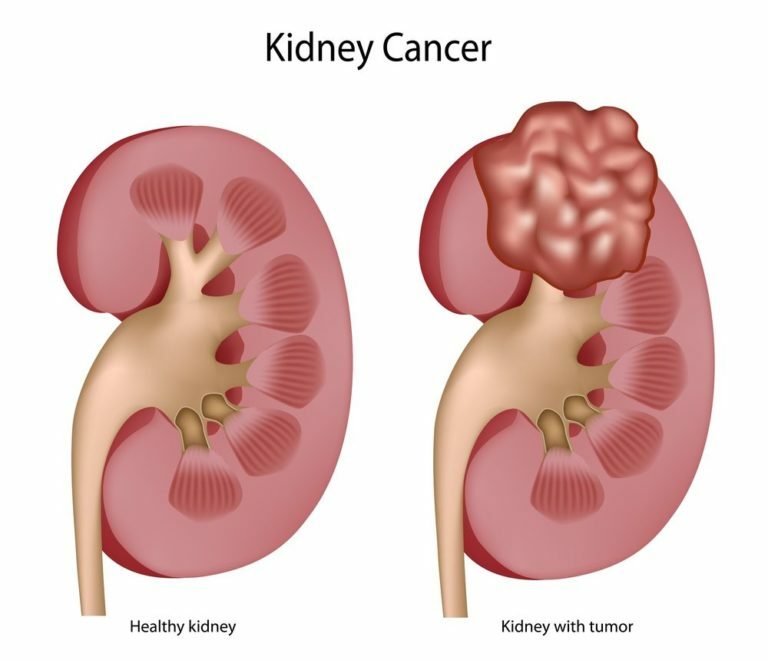 There are several types of cancers that can affect one or both kidneys, including renal cell carcinoma – the most common form of kidney cancer found in adults. Certain risk factors increase the likelihood of being diagnosed with kidney cancer, including smoking, age, high blood pressure, and obesity. Long term prognosis is best among patients who are diagnosed and undergo treatment during the earliest stages of the disease. that the risk of developing kidney cancer is much lower than that of other urological cancers? About 1 in 63 Americans will develop the disease in their lives, with men outnumbering women nearly 2 to 1. The American Cancer Society predicts more than 65,000 new cases of kidney cancer to be diagnosed in the U.S. this year. Most will occur in adults over the age of 55. Kidney cancer symptoms usually do not appear until the disease has reached progressed stages. They may include weight loss, fatigue, occasional fever, chronic back pain, and blood in the urine. See your urologist if you are experiencing any of these symptoms or others that cause you concern. How will my urologist make kidney cancer diagnosis? If your urologist suspects that you could have kidney cancer, you may undergo lab testing and urine tests to detect blood in your urine. Additional tests may also be necessary, including CT imaging or a kidney biopsy. What types of treatments are available to patients with kidney cancer? Treatment for kidney cancer varies according to type and stage. Usually, surgery is performed to remove the tumor from the kidney or perhaps the entire kidney and surrounding lymph nodes. Ablation techniques are an alternative to surgery and use extreme temperatures or electrical currents to kill cancer cells. Your urologist may also recommend immunotherapy, radiation treatment or targeted therapy to prevent the spread of kidney cancer to other areas of the body.